¶ 3 Leave a comment on paragraph 3 0 It seems like Dylan had a Dylan had a blues concordance sitting on his desk as he wrote Pledging My Time, pulling out various stock phrases and tossing them in. Phrases such as “early in the morning”, “late at night”, “early in the morning/and late at night”, “feel all right” can be found in hundreds of old blues songs. 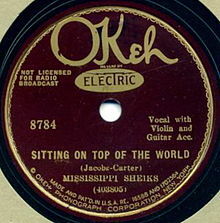 ¶ 4 Leave a comment on paragraph 4 0 Many commentators have noted the musical similarities between this song and the Mississippi Sheik’s Sitting on Top of the World, which Dylan covered on his As Good as I’ve Been to You recording. ¶ 7 Leave a comment on paragraph 7 0 Dylan biographer Robert Shelton notes that the lyric “resembles improvised blues with sophistication creeping in.” An excellent point. Even when Dylan is simply riffing on old blues numbers he still consistently manages to put in something to lift the song from the ordinary. ¶ 8 Leave a comment on paragraph 8 0 Here’s an excellent live version! ¶ 16 Leave a comment on paragraph 16 0 Won’t you come with me, baby? And I can’t be the last to leave.